“It’s not something I talk about very much, but as I look back on it, it’s clear that the Lord had a path arranged for the Lutheran Heritage Foundation from the time I went to my first call as a Lutheran pastor,” recalled Rev. Robert Rahn, who together with a Board of Directors headed by Rev. Robert Preus, founded LHF on Nov. 10, 1992. It was a time of amazing opportunity. The atheistic Soviet Union had collapsed and for the first time in 70 years, doors were open to sharing the Gospel of Jesus Christ with people living behind the Iron Curtain. 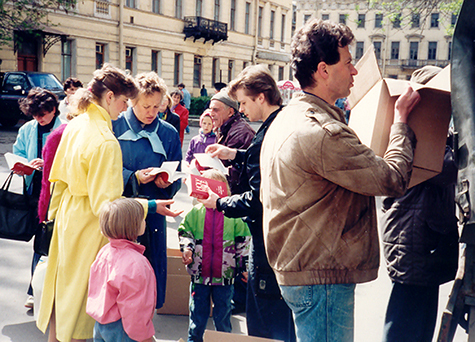 LHF in 1992: Distributing Bibles in Russia’s Red Square, where such literature had been forbidden just a year earlier. Rev. Rahn seized the opportunity by traveling to Moscow, where he and a few friends distributed Bibles and tracts in Red Square (pictured here). During his time in Russia, Rev. Rahn saw a hurdle to telling the people about Jesus: there was very little Lutheran literature available in the language of the people. So from the basement of his home, Rev. Rahn started LHF, a mission organization that 25 years later would be translating and publishing confessional Lutheran literature for people in more than 80 countries and 100 languages. Though the organization has gone through many changes throughout its growth, one thing has never changed: the commitment to solidly confessional Lutheran teachings, most simply put forth in Luther’s Small Catechism. As he has stepped back from the daily leadership of LHF activities, Rev. Rahn expressed confidence in Rev. Matthew Heise, who has been LHF’s executive director since 2014.